Dorothy, Alberta, not a ghost town yet! 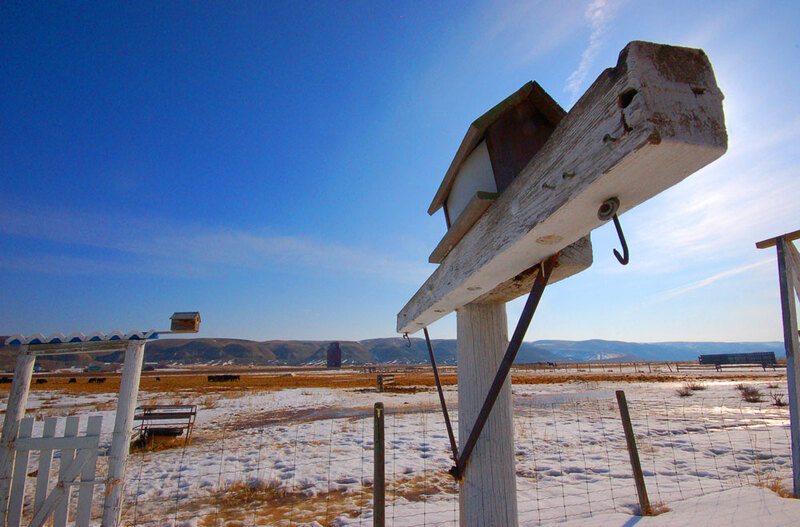 Dorothy is a small settlement that sits on a widening of the riverbed about 35 km southeast down the Red Deer River valley from Drumheller. Population: 9. Linda Miller runs the local Bed & Breakfast out of her 1909 farmhouse. Her brother and other family members live close by. She’ll set you up with a warm, clean bed for the night and a decadent spread of home-made goodies to start off your day. If you’re interested (and you’re nice about it) Linda will let you in on a little history from the area and a few tall tales from this pioneer community. The old grain elevator in Dorothy, Alberta. Linda’s father, Ed Pugh, was a cowboy and rancher. At various times he pitched in as chuckwagon judge, stock crew, flagman and “Trail Boss” for the Calgary Stampede. He trailed horses back and forth from the Calgary Stampede Ranch in Hanna (where he worked the bucking broncs) to the big show in Calgary until 1964 when the Stampede started trucking the horses. Sort of like a cattle drive, horses would be herded back and forth every year to the Stampede Grounds. When Ed Pugh died, cowboys with the Stampede honoured him the traditional way: by staging his “Last Ride” – cowboy boots mounted facing backwards in the stirrups of his riderless horse, with his cowboy hat and saddle proudly displayed. Linda’s husband came from a line of Hanna pioneers and spent many years as an auctioneer in Dorothy. Some of her kids and grandchildren are still working in that business. She told us about the Bachelors of Dorothy who made the news long before the TV reality shows of today. At one point, there were 20 eligible bachelors between 30-40 years old living in Dorothy. A newspaper got wind of this and held a contest to find the perfect bride. A woman from Chicago was flown in by the paper to meet the bachelors. No marriage resulted, but it got some good press and livened things up around Dorothy for a while. One of the bachelors was Herman Kasten. He owned the little house which now stands by the road, with the B&B sign on it. Linda told us Herman retired to Dorothy “from up on top” (the plateau above the valley) after selling his land up there for 50¢ an acre. There are many pioneer buildings in Dorothy, Alberta. Linda is a busy lady. She busys herself with organizing ghost town tours and promoting local entrepreneurial women. Both of Dorothy’s two churches, the United and the Catholic, are included on the tours. But there’s a problem: she does not like Dorothy being referred to as a ghost town. Linda, after all, has been living and working here all her life. There are no ghosts, just memories of all the hard working people who spent their lives in this valley. Dorothy is listed on the website ghosttowns.com | Video of Dorothy and some pronghorn antelope | This website has a great picture collection from Dorothy. I love eastern Alberta and when I next have an extra day I am going to go on the search for Dorothy. The land to me is beautiful in all seasons and I love the big skies you’ve captured in the photo. With a population of 9 it is far from a ghost town. Excellent post and good historical recollection. 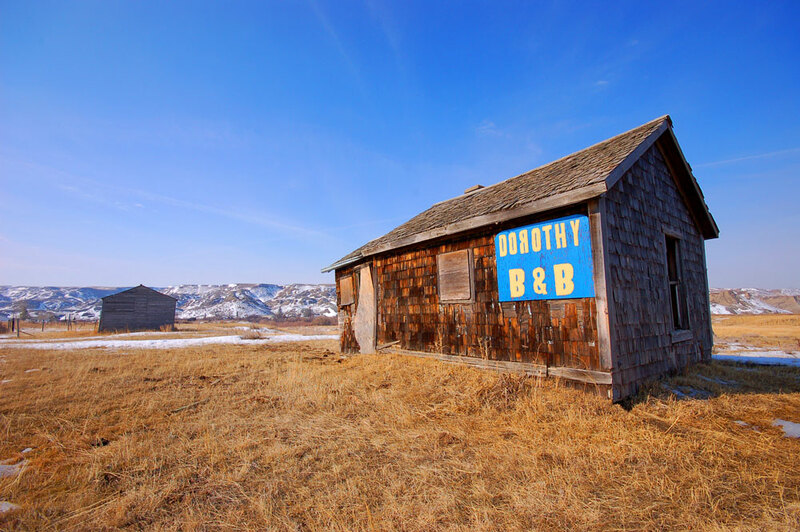 Enjoyed the great photos and the story behind the B and B sign. Thanks for sharing. I will drop in the next time I am out that way. I have a longing to revisit Rosebud this summer. Excellent succinct article. I got a feel for the good hardworking Canadian women there. Beautiful photos. On a trip from Calgary, we took the road that carried us into Dorothy. Best detour ever!! Driving into the valley was breathtaking. I would have loved to stop and spend a few days. Didn’t have the thought to video. Didn’t want to take my eyes off the view. Does anyone remember John Lane who used to live in Dorothy? He was my uncle & he passed away around 1988. He had quite a collection of memorabilia in his basement & there were quite a few ‘accidental’ visitors to his house from all over the world. I know he showed us a guest book with lots of names. No relatives to ask that I know of. Very interesting man. As a child, we often took the Dorothy ferry to get to my grandfather’s in Sunnynook. What was the name of the artist who carved juniper roots?